A dramatic address delivered on the verge of Israel?s entry into the land of Canaan, Deuteronomy has been described as a book "on the boundary." Ted Woods expounds its all-encompassing vision and shows how the Israelites were exhorted to make its words the interpreter of their life's story within the land "beyond the Jordan." 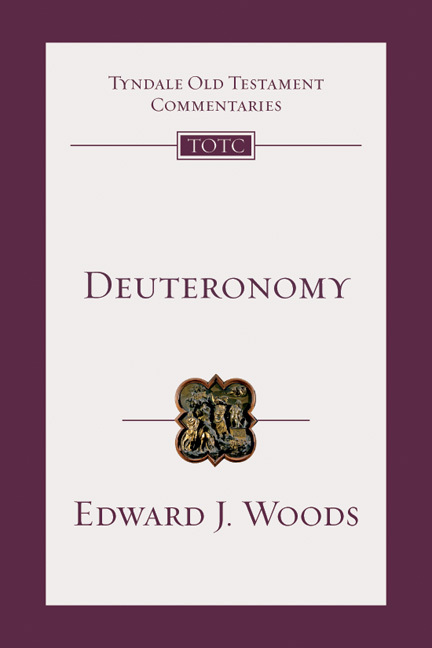 This completely new volume replaces the previous editon of Deuteronomy in the Tyndale Commentary series written by J. A. Thompson. Now retired, Edward J. Woods was formerly Senior Lecturer in Old Testament at the Melbourne School of Theology, Victoria, Australia (formerly the Bible College of Victoria), where he still teaches part time. He has also served as a moderator in Old Testament studies for the Australian College of Theology, as a pastor in Australia and as a theological teacher in Northern Zambia.